The Shoeboxed Receipt Tracker app is the easiest way to submit receipts while you’re on the go. Simply snap a picture, add a note if you’d like, and click submit. The receipt will undergo our famously fast processing, including human verification of the data, and be made available in the app and your online Shoeboxed account within 24 hours. If you already use the app, you will receive a notification shortly prompting you to visit the Google Play Store to update it. 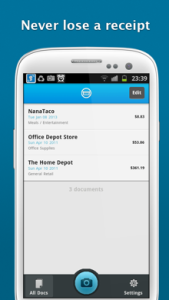 If you haven’t already tried the Shoeboxed Receipt Tracker for Android, click here to download it. iPhone user? Don’t worry, we’ve got you covered! You can download the Shoeboxed Receipt Tracker for iPhone here. If you have any feedback or questions about this new version of our Android app please reach us 24/7 at help@team.shoeboxed.com or give us a shout on Twitter @Shoeboxed.